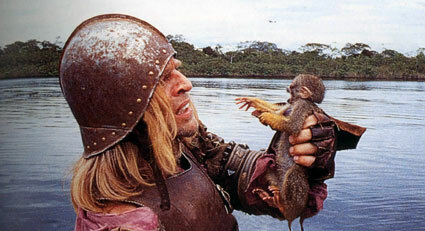 Aguirre: Wrath of God is one of German director, Werner Herzog’s, most critically acclaimed films following the harrowing tale a doomed band of Spanish conquistadors hunting for the lost city of El Dorado. Though written in just two day and half days by Herzog during a drunken soccer bus trip (eight of the final pages being tossed out the window when a fellow busmate vomited on them), Aguirre combines two actual historic expeditions down the Amazon by Pizarro and Ursua. In the film, Ursua and Aguirre are dispatched on a mission down river by Pizarro to discover the fate of another conquistador, Orellana’s, mission and confirm the existence of the lost city of treasure. Accompanied by the tasty Helena Rojo, starring as Ursua’s mistress, and Cecilia Rivera as Aguirre’s ill-fated daughter, the expedition embarks on a voyage fraught with peril. Beset on by blood-thirsty Indians, oppressive heat, hunger and disease, and a river that threatens to swallow them all, the group quickly disintegrates into madness. I’m not going to tell you how it ends, but I will tell you this, there’s a shitload of monkeys. What’s equally fascinating about this 1972 indepedent film is the backstory behind its production, specifically the relationship between director Herzog and lead actor Klaus Kinski who played the mad Aguirre. Fans of Herzog’s movies are familiar with the two’s history (see My Best Friend: Klaus Kinski), having made 5 films together including another great jungle epic, Fitzcarraldo, about a visionary if not slightly insane, explorer who lifted a steamship over a mountain. The two would routinely battle publicly on set and at one point in their collaborative careers each had a contract out on each other’s lives at the same time. 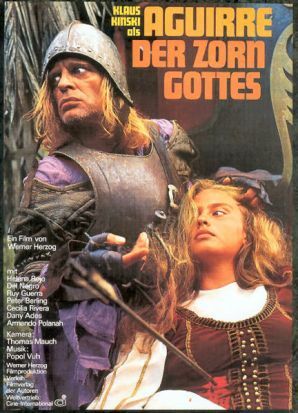 After repeatedly butting heads on how Kinski should play Aguirre, and being deliberately antagonized to the point of insanity by Herzog to bring out a believably psychotic performance on camera, Kinski lost his mind one night and shot three rounds into a rowdy nearby crew hut, blowing the finger off one crewman. Later in the production, Herzog threatened to kill Kinski if he walked off set. Strange stories abound surrounding other aspects of the production, how the props and crew were constantly plagued by the treacherous Amazon river, how Herzog stole the 35mm camera the film was shot on, how he illegally snuck 400 monkeys through customs for the final scene. 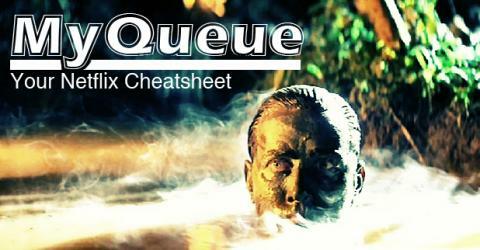 No matter how the film was made, it still stands up as a taught, visceral adventure movie that went on to inspire other great films like the Mission, Apocalypse Now, and even the Predator.